Grave Reference: X. D. 1. Additional Information: Son of Harry Percy and Charlotte Amy Stace, of “The Croft”, Brackley, Northants. 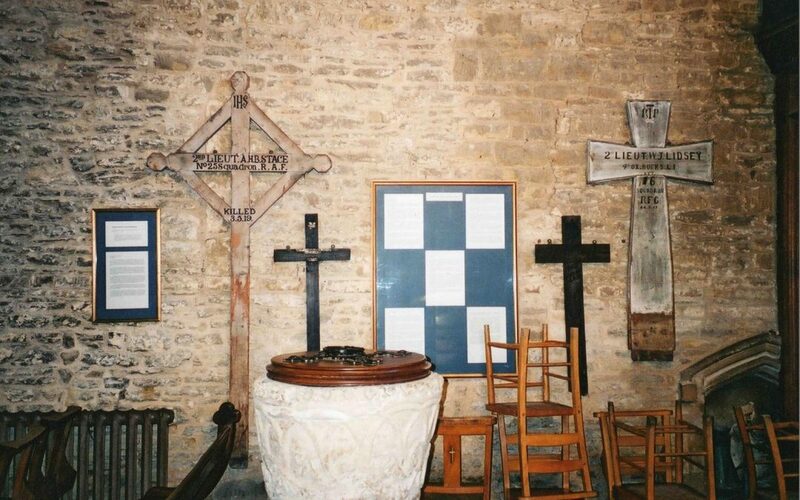 Concentration burial from Mons British Cemetery, All reburials were identiied by crosses grave markers, so this may be his original cross from there. ARTHUR HOWARD BARTLETT STACE was the only son of Mr. and Mrs. H. P. Stace of the Croft, Brackley. He was born at Brackley on February 28, 1899, and entered Oundle (Crosby House) in September 1913, leaving in April 1917. He was a member of the XV and captain of boating. Stace joined the Air Force and went to France in September 1918, joining the 25th Squadron. During his six weeks of active service before the Armistice, his work was chiefly reconnaissance and photography. He was accidentally killed while flying, on May 3, 1919. His Commanding Officer described him as a most efficient officer and a keen sportsman. Regiment/Service: London Regiment (Royal Fusiliers) “C” Coy. 4th Bn. Grave Reference: X. G. 2. Additional Information: Son of Robert E. and Selina A. Aldous, of 8, Ellesmere Terrace, Brackley, Northants. Another concentration reburial although it is unclear where from exactly. It also appears that his original grave was marked as unidentified and had no cross, so his marker may date from his reburial where it is possible he was identified. Regiment/Service: Canadian Infantry “C” Coy. 54th Bn. Grave Reference: Against North wall. Additional Information: Son of Selina Annie Aldous, of 8, Ellismere Terrace, Brackley, Northants, and the late Robert Everett Aldous. War Diary 54th Battalion – On June 9, 1918 there was a Brigade church parade and a presentation of honours at DIEVAL, ribbons being pinned on the recipients by Maj – Gen. A. C. MacDonnell, CB, CMG, DSO, General Officer Commanding, 1st Canadian Division at which Pte. Aldous was recognized with his MM. Died of self inflicted wound, gunshot wound in the right temple. Link here. (Image – courtesy Library of Canada). He was awarded the MIlitary Medal. “Francis Lidington Aldous was born November 4, 1891 at Brackley, Northamptonshire, England, son of Robert Everett Aldous and Selina Annie Aldous. Prior to the start of the war, Frank migrated to Canada and was living in Victoria, British Columbia working as a dairyman. Frank enlisted into the 103rd Battalion at Victoria on December 8, 1915 being assigned regimental number 706137. Pte. Aldous embarked from Halifax, Nova Scotia aboard the S.S. Olympic on July 23, 1916 and disembarked at Liverpool on the 31st. Pte. Aldous was posted to the 16th Canadian Reserve Battalion on January 9, 1917 prior to proceeding to France on the 20th and being taken on strength with the 54th Battalion on February 17, 1917. On April 18, 1917, Pte. Aldous was sentenced to 7 days Field Punishment No. 1 for Committing a Nuisance. 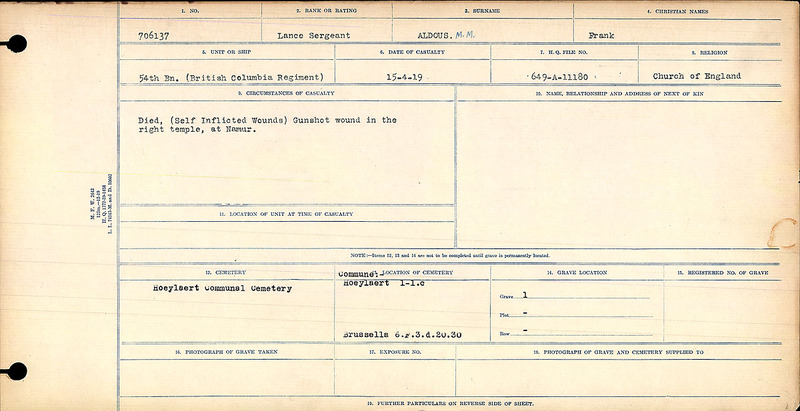 He was subsequently seriously wounded by a gas shell while in the Vimy-Angres Line on June 11, 1917 and was evacuated to Boulogne not rejoining the Battalion until September 15, 1917. Frank was promoted to Lance Corporal on August 13, 1918; to Corporal (to complete establishment) October 1, 1918; and, again to complete establishment, to Lance Sergeant the same day. Frank must have led a charmed life as he went the remainder of the fighting without requiring medical treatment although he was involved in actions with the Battalion until the end of the war. At 09.00 hours April 15, Frank’s bunkmate noted Frank’s rifle was missing but thought nothing of it. At 13.45 hours Frank Aldous was found in the Foret de Soignes, deceased from a single gunshot wound to his right temple. A note in his pocket read To whoever finds me, I am Sergeant F. Aldous, 54th Battn., Canadians, Hoeylaert, Adieu. Grave Reference: V. A. 38. 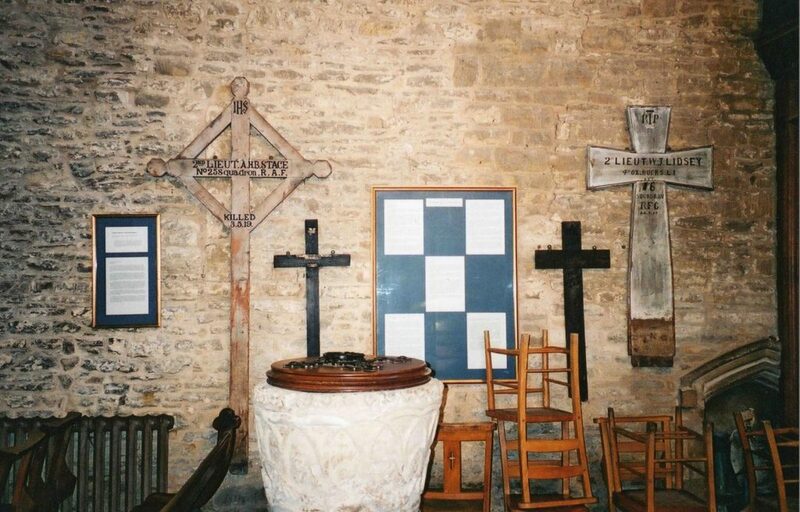 Additional Information: Son of William Isaac Richard and Emily Crosier Lidsey, of Banbury. He started the war as a Private in the 1/4 OBLI, before being commissioned. He took part in the fierce fighting for Pozieres in 1916. William Lidsey and F/Sgt. 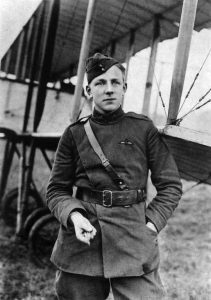 Sidney Herbert Quicke of the R.F.C were shot down by Manfred Albrecht Freiherr von Richthofen (the Red Baron) at 17.30 on the 21st March 1917. This was kill no. 29 (he had 80 in total) and was flying a Halberstadt D.II aircraft, whilst Lidsey was flying a B.E.2e aircraft with the registration A3154. The incident happened above Hill 123, North of Neuville in France. Main photo courtesy of Andrew White.